The Hawaiian island of Oahu is home to Honolulu, Waikiki Beach, Kailua, the North Shore, and is a tropical destination for many families each year. My husband and our oldest son recently had the privilege of visiting Honolulu and its surrounding areas. Before our visit, we did our research to find the lodging and activities that would be best for our family. We were also fortunate to get great tips from locals while we were there. 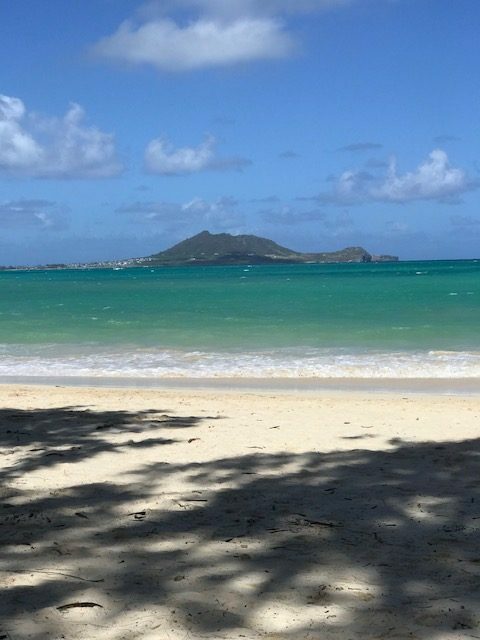 From where to eat to where to stay, here are a some family-friendly things to do in Honolulu Hawaii. 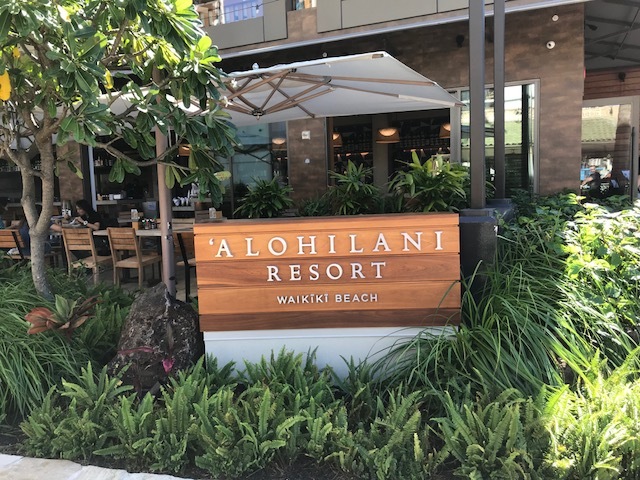 If you are looking for affordable, family-friendly luxury in a tranquil setting, look no further than the Alohilani Resort. The resort is located across the street from the section of Wakiki Beach known as Kuhio. It is steps away from surf, sand, dining, and retail. The hotel itself boasts several restaurants and shops as well as a gym and spa. There are two gorgeous rooftop pools. The first is an infinity pool which offers a gorgeous view of the ocean. The second is a kids’ pool, which is also beautiful and maxes out at a depth of two-and-a-half feet. There are relaxing cabanas and lounge areas surrounding both rooftop pools. The two are separated by a set of stairs, giving the kid section a truly family-friendly vibe. The resort has a Kids’ Club and separate rooftop area with outdoor tennis courts and batting cages. There is a calendar of activities for both children and adults, and plenty of grown-up amenities as well. 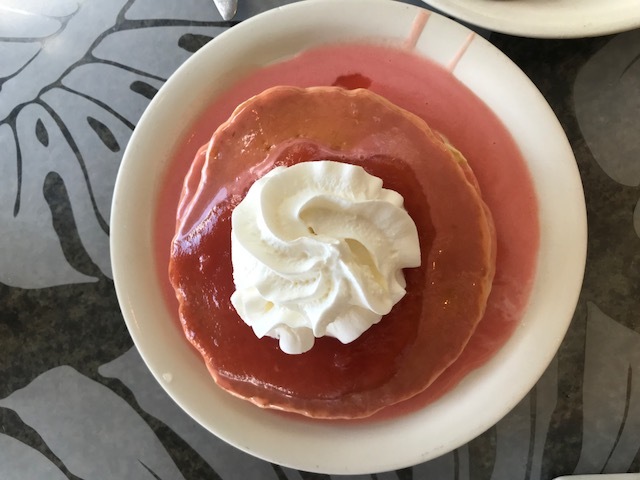 We dined at Eggs ‘n Things Waikiki on our second day in Honolulu. Before going, we read amazing reviews, which warned visitors not to be discouraged by the long lines they’d encounter when they arrived. After waiting in the outdoor line for a bit, we placed our order. Once we were seated, the restaurant definitely lived up to the hype. The food was incredible. Our son loved the All Fresh Fruit Rainbow Pancakes. 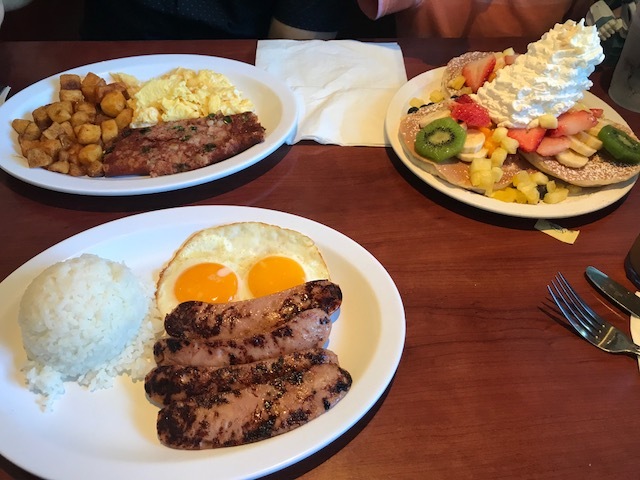 My husband was a fan of the corned beef hash and breakfast potatoes (amazing), and I enjoyed my chicken mango sausage and eggs (and rice—everything in Oahu comes with rice). From small convenience shops to high end luxury boutiques like Tiffany’s and Cartier, the Honolulu/Waikiki area is filled with shopping centers. 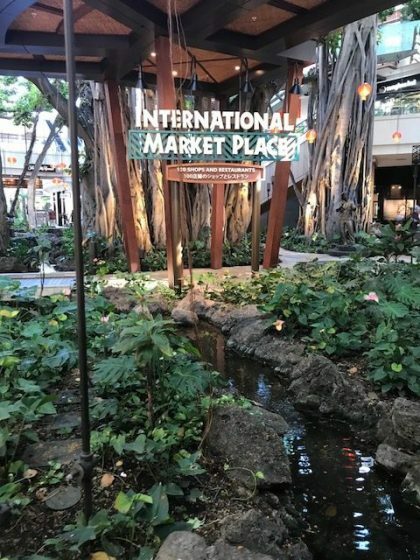 The International Market Place made our list because of its amazing selection of shops and restaurants, beautiful indoor/outdoor design, and fun activities. As we walked through during our visit, we observed a yoga class on the green space beneath the Grand Lanai. The mall also offers lei-making classes and a family-friendly “sunset stories” series. It is a great little escape if you’re looking for some retail therapy. Located on the first level of The International Market Place is the National Geographic Fine Art Galleries, a small art gallery featuring beautiful photos by National Geographic photographers. 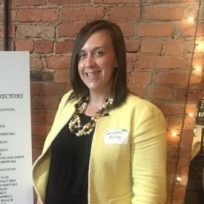 The Galleries include docents who will answer any questions you have about the pieces, and is a great little refuge for the arts-minded visitor. Diamond Head State Monument is an iconic geological marvel with a significant history. 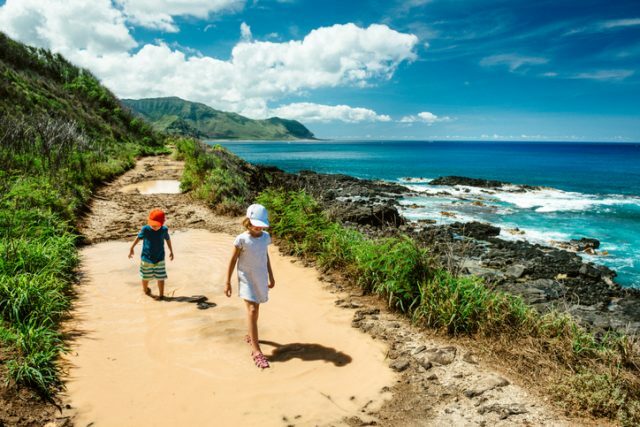 Adventure-seeking families head to Diamond Head every day for the Crater Hike. The trail features a nearly one-mile vertical climb to the top of the crater. The reward at the top is a gorgeous view of the island and surrounding ocean. The hike is fairly strenuous. Even still, it is appropriate for visitors of all ages including families. My husband and I did the climb with our three-year-old, and we saw many other parents finish the hike with young kids in tow. The grounds also provide restrooms, souvenirs, and food trucks with pineapple treats (a kid favorite). 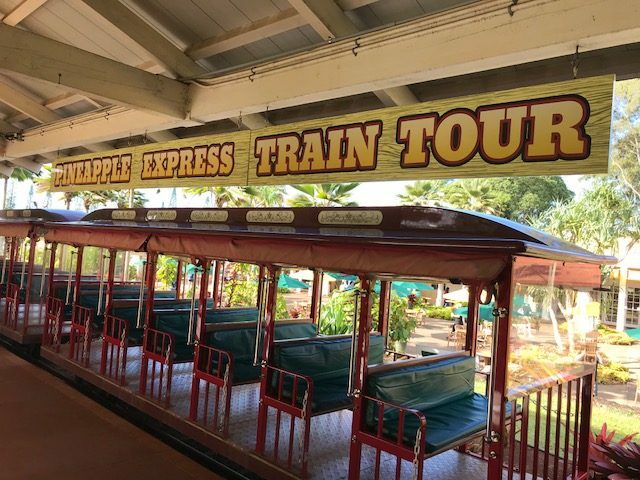 Located a bit outside Honolulu, The Dole Plantation provides visitors a family-friendly “Pineapple Experience.” It is a working plantation that also offers fun pineapple-themed attractions including the Pineapple Garden Maze, a Plantation Garden Tour, and the Pineapple Express Train Tour. The latter takes visitors on a two-mile round trip tour of the plantation, and is a big hit with young train enthusiasts. The on-site shop houses the Plantation Grille, which sells the world-famous Dole Pineapple Whip—a crowd pleaser for the entire family. Before our vacation ended, we made sure to hit Cinnamon’s at the Ilikai. A local recommended Cinnamon’s during our stay and it did not disappoint. I enjoyed a phenomenal crabcake Eggs Benedict and our son loved the Guava Chiffon Pancakes (which we all split and were so worth it). 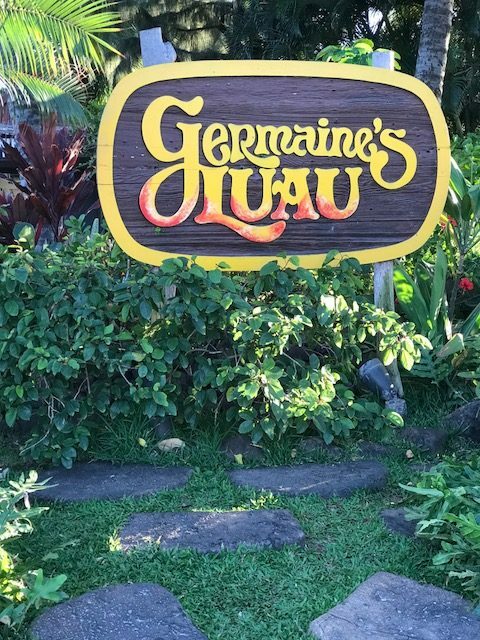 If you are looking for a traditional Hawaiian Luau experience during your visit to Honolulu, Germaine’s Luau is the place to go. Germaine’s sits twenty-seven miles outside of Honolulu and can be accessed by car or shuttle (provided by Germaine’s). We rented a car for our stay, so we drove ourselves. Germaine’s Luau is located on gorgeous beachfront property. Guests dine on a sandy beach in front of its main stage. Germaine’s is a family show. Children and adults are invited onstage to learn hula and to perform various other dances throughout the night. For us, this was a must-see attraction that did not disappoint. 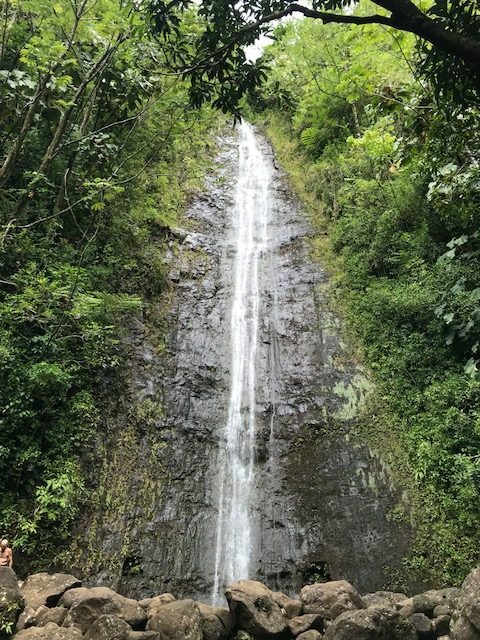 Like Diamond Head, the Manoa Falls Trail Hike is a somewhat strenuous-but-doable hike for visitors of all ages. At the top of the trail, hikers enter a beautiful clearing that opens to the Monoa waterfall. We completed the hike with our son, and we saw many other families with young children. The views throughout are gorgeous, but be aware: the hike gets incredibly muddy as you near the waterfall, so be careful on your way down! We did the Makapu’u Point Lighthouse Trail hike on our last full day in Hawaii, and it quickly became our favorite hike from the trip. 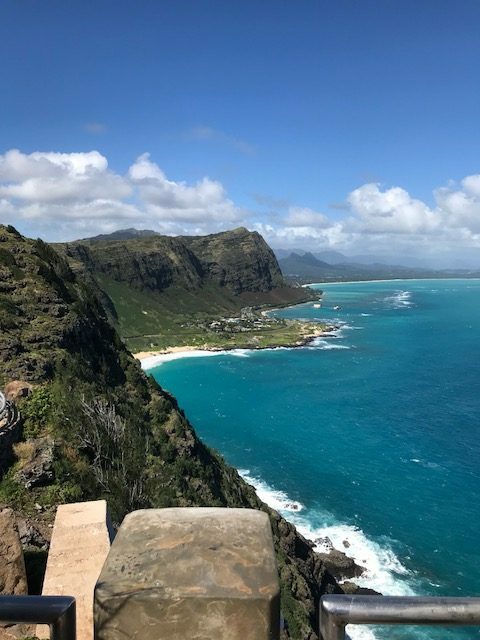 It is located a bit outside Honolulu in Waimanalo, but is absolutely worth the drive, which, by the way, offers gorgeous coastal scenery. 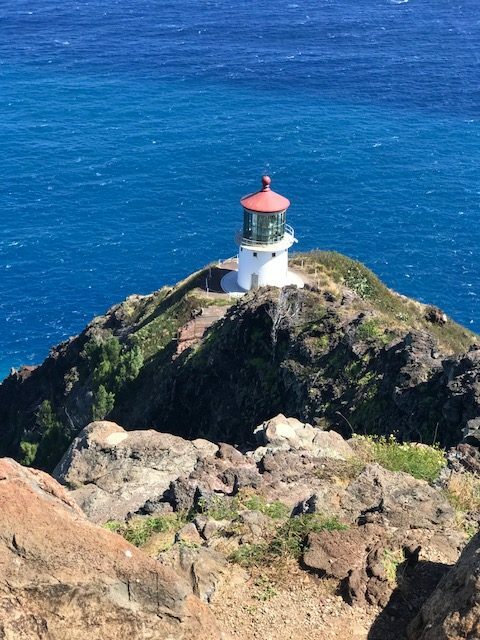 The Makapu’u Point Lighthouse Trail is a 2.5 mile out-and-back paved trail that offers beautiful views of Oahu. The area is a great spot for whale-watching during certain times of the year. We spotted some during our hike, which was a thrill for our three-year-old. Although the vertical hike is physically challenging, it is doable with children and we saw many other families enjoying the fresh air and the views. 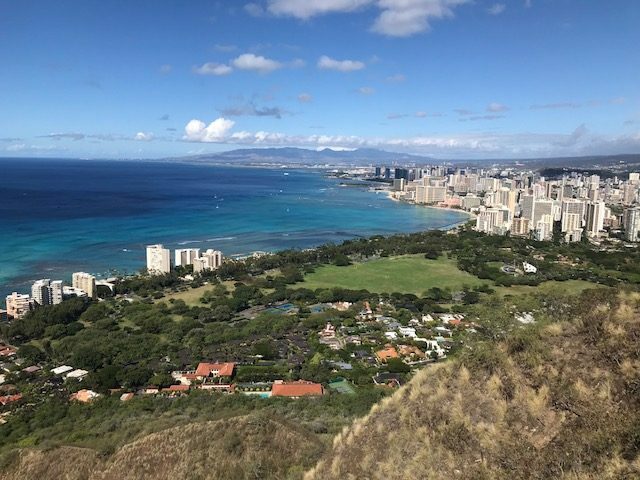 We received a lot of advice to get out of Waikiki while we were in Oahu, and as people who love to escape crowds and explore less familiar terrain, we made sure to do much of that. After hiking the Makapu’u Point Lighthouse Trail, we visited Kailua Beach Park. Compared to Waikiki Beach, the crowds were much smaller. Dozens of parasailers were out enjoying themselves. Families sunned on the beach. It was the perfect spot for us to sit, enjoy lunch, and soak in breathtaking views of the ocean and mountains. Finally, what’s a visit to Hawaii without Hawaiian shaved ice? 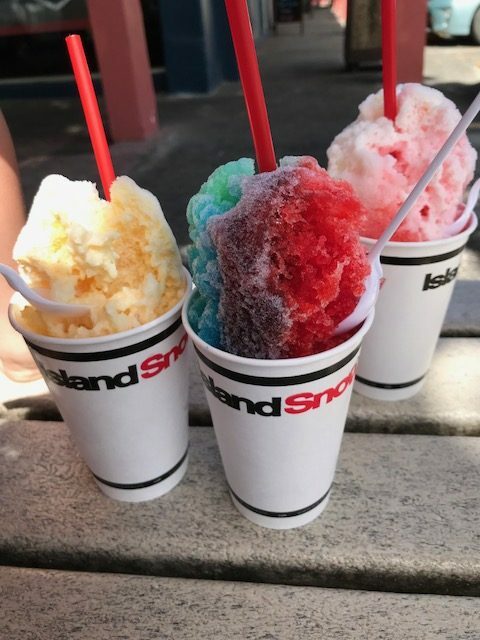 We received tons of recommendations for where to find the best shaved ice while there, but Island Snow won us over. Island Snow is a clothing shop/brand with a shaved ice counter in the back of the store. We enjoyed the flavors we tried and were so impressed by the service from the young staff behind the counter as well. Located in Kailua, Island Snow was the perfect way cap off our visit.